The best way to honor the lives of my ancestors is to become free from the beliefs that kept them down, to recognize their efforts and become a wiser and more caring person with the tenacity to change and grow as life goes on. It's the same as maturing and developing autonomy from my parents. They did the best they could, and my life gives me the freedom to find my own honest way, to experience connections that my parents could not see. In a certain way, I help them and their legacy by discovering my own living truth, by being an awake and responsive human on the totem that I am a part of. When a person dies, beliefs and constrictions release. Anything that separates falls away. I recon that if an ancestor or a parent who has died could see us now, that personified love would include wanting us to be free from their antiquated ways of thinking. They'd want us to live life unconstricted by the constraints they experienced and taught to us. The stuff that we got trapped by. There's an inherent forgiveness about that, and an ability to move on. It's a strong sense I've gotten since my dad died. I've spoken with other people who have lost a parent and had similar insights. That was something I wrote on Facebook, which came up as a memory from this day in 2015. What I wrote then fits just right into the work I'm doing now with Biodynamic Craniosacral, since this work helps the body tissues release their conditioned patterns. We can actually release the stuff from the body rather than just managing ourselves for the rest of our lives, which actually speaks to the impermanence of conditioning. It may seem like we get permanently changed from life's hard knocks but the underlying health and vitality that knows about freedom is always here, ready to re-emerge and rejoin the joyous openness we truly are. Who knew Leonard Skinner was so in touch?! FREEBIIIIIRRRRRD! 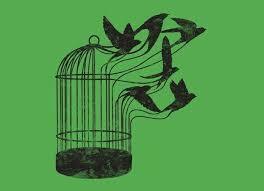 And before Leonard there was Rumi ~ "But how should the cage-bird know about the air?" Our human ancestory has many voices, all singing about the same thing. This is true: we never arrive at the final resting place while we're breathing and our hearts are beating. That truth is settled for me, which is a funny contradiction to the statement. But life is full of contradictions so I'll accept it and continue. Given that we never arrive at the final resting place while we're living in bodies, what matters? I'll tell you what matters! (wink - don't take me too seriously. i'm just playing with what I understand.) Orientation is what matters. How we orient ourselves. It might be a friendly question - "How am I oriented?" or "In what direction am I oriented?" The answer to this question will and does change by the moment so it's good to be paying attention in a friendly way. Yoga postures are helpful for practicing orientation. Each pose has particular anatomical focus so when we engage the pose and orient toward it's focus, we can discover things about ourselves. Take pigeon pose and it's primary focus - the deep hip muscle called piriformis. Since we live in chairs these days and since we tend to manipulate and manage ours emotions, we are people of tightened piriformises/piriformi, however you pluralize that word. Over the roughly 18 years since I began practicing yoga, I've been learning about myself in pigeon pose. When I engage pigeon pose, I can either orient to my piriformis and allow layers of discomfort to be felt and sometimes released (usually intense and sometimes illuminating) or I can just hang out in the territory of normalcy and easiness. A useful thing about yoga poses is that we can physically engage toward our orientation. To find the piriformis, I engage both legs to be turning my pelvis forward: front foot active as if I was standing on it, shin perpendicular to my back leg, hip rooted back and down (there's the piriformis! ), and my back leg is internally rotated, usually with my foot flexed to help that leg stay engaged. It's a workout to stay focused that way and no matter what I do with my upper body (rising up or lying forward) my front leg piriformis is given my full attention. Orientation is more than physical activation, though. It's really an internal focus, which can seem bewildering. Luckily it is something we can practice and learn to recognize how to engage in subtler and greater ways. What I said above about being friendly is a necessary quality to the internal orientation. Not pushing, punishing or fixing, just befriending and turning in the direction of the hidden stuff. In the direction of freedom. In the pigeon, as I orient to my piriformis I can discover a letting go of my well-practiced demands on myself, aka tension. It doesn't matter if the pigeon looks great. How am I aware inside my hip? How am I orienting as I do anything at all? Yoga and life are not for presentation. I don't care if there are yoga competitions and lip injections... whatever.... True presentation happens, uncontrolled and unpredicted, from how we are orienting within ourselves. That's how love is. Love gets out of the chair and unlocks what's stuck. Love says "You can be free from that tight grip! You can be free. It might seem scary and it might hurt for a moment, but it's ok. I'll go through it with you, sweet hips!" ​Thinking about the themes in my life, the one that rises to the top is about authenticity - being who I really am so I can relax and connect with other people as they really are. I'm not saying I've got this down, I'm saying I've got a deep yearning to be authentic, because I don't think it's been my go-to experience. In pursuit of myself (isn't that weird? me pursuing me?) I've been influenced a lot by various religious and spiritual guidances, academic doctrines and social expectations, but I've come to see that anything that rings true is not really an instruction for self-improvement but an indicator of authenticity. I notice that when I'm not trying to be agreeable I fall into agreement with myself, which is easy for other people to be around. When I'm not trying to be helpful I become honest, which is actually helpful! When I'm not trying to memorize concepts a bigger picture becomes clear. And when I'm not resisting myself I become tolerant, understanding and capable. For a few years, I was a facilitator of a class in a women's prison. It was a volunteer gig with an organization called Truth Be Told. The class was called Talk To Me in which we all did background investigation into our current prisons. For the incarcerated women, they could look at what lead them to prison. For all of us, prisoners and facilitators alike, we identified our internal prisons. Then we wrote about how we got there and we took turns over several weeks reading our stories to each other and also did Authentic Movement to express the story though our bodies. It was an act of freeing ourselves from the silence and internal manipulations that were coming out in our lives in hurtful ways. It was an invitation to be authentic. ​I took on that volunteer gig because I needed a platform of honesty for myself. I felt that I was missing the interactive, relational capability that I longed for and it was difficult for me to come clean to myself and others in my life. Facilitating that class, along with several other good decisions and commitments I've made over many years, helped me learn something powerful about authenticity. When I accept my own experiences I become free and I become a safe person for others to be free around. Now that's true facilitation! Not perfect, not an exact science, not someone else's idea of how my life should unfold - simply discovering that my own way is just right. Through the lens of authenticity, the whole concept of "help" is turned on it's head. It's about embodying myself and discovering that I have faith in others to embody themselves. I don't need to hide behind stories, beliefs, theories and techniques, although those things do inform my understanding and they come in handy at times. But in those moments when I'm free in myself there's a natural outflow of helpfulness that does not require recognition or belief in a theory, technique, etc. And it really is a moment to moment thing. I don't believe any of us ARE authentic or not authentic, it's a matter of how we're relating in each moment. I'm generally comfortable with my disposition these days. It's different than it was. I think that "just be yourself" doesn't come easy for a lot of us in our culture, so it's relaxing to embrace this imprecise experiment of being me. There is no ultimate program to follow or package to buy and sell; no theory to learn and defend, no religion to swallow as truth, no degree or costume or moniker to stand behind - not in my understanding of authentic life. Sure, those things exist, but I'm not defined by them. Sometimes it seems lonely to let go of all those identifiers, because that's supposedly where all the groups of "like-minded friends" hang out. Will I be alone without identifying with those clubs and products and beliefs? In the best way, yes. Alone and not lonely. Because authenticity includes autonomy - intimately alive in my own body, in the moments of my life, moving freely and touching reality, leaving the door open to those beautiful moments of true connection that remind me why I let go of the confining safety boxes I squirm around in. And it means that I can appreciate this in others, so relationships can stop being about expectations and pre-designed agreements and they can become discovery and creativity and mutual freedom. Yes, I think the world needs this. To me, the story of Easter, the resurrection, is about each of our awakenings, beginning with our physical birth and continuing with each healing, reunifying experience throughout life. The more subtle we become in our awareness, the more we do ease back into our unified essence. This is what the wisest meditation practices are about. I think the word "namaste" is a spoken reminder to open the door of consciousness to ourselves and each other and the whole thing. This has been a lot for me to make honest room for in my mind, but through healing experiences I feel a gradual embodiment of "namaste". I've been noticing this recently, even though my mind is a strong protester. But what a surprise. It's not something I can honestly stay with all the time, but when I notice I've dug myself into struggle and complicated divisions in my mind I can at least remember my body knows about the undivided ease of it all. And sometimes I fall back into the ease. Biodynamic Craniosacral involves a lot of embryology. It really involves deep investigation of the entirety of the human body experience and super pivotal stages such as conception, igniting of our vital systems, development of body in utero and the birth process. The design of the body is carried through our genetic information, referred to as "original blueprint", and the building of the body in utero and even during birth - lungs start working when we are in air, nutrient intake switches from umbilical cord to mouth - is done through the actions being carried out by the blueprint information. Arms are not built to reach, it's the other way around. It is the intelligence of our systems to reach, and it's the reaching action of the early tissues that actually builds the arms! When I learned that, it was just awe. What's elegance and amazement. Life is movement indeed. And the whole coming into air from a fluid world? What a transformation we each had on our birthdays! ​​We are sparked into being by the dynamic passage of human encoding carried through all the bodies before us. There is the blueprint of the human function/form and there is the limitation on that function/form imposed from disruption and repeated harm that gets internalized. Think of your own life and how many things have happened that are still hard to be with, things that have narrowed your view of safety and possibility since childhood, experiences that sparked a belief in separateness. Consider how the genetic information, passed through eons of human lives just like yours, might be carrying a narrowed expression of the vastness of human possibilities. The fullness of our nature gets pulled, twisted and blocked over the course of a life. Trauma (uncompleted process, segmentation of the whole) is a biochemical/material story that's being told for eons that we each carry. Trauma, passed along unrecognized and unhealed, creates a story of body disharmony coupled with mental beliefs we cling to, and our culture designs all sorts of medical procedures, laws and churches based on a belief that the uninvestigated trauma creates, and vice versa. I don't mean to be a downer at all here. It's just that, "if you can't feel it you can't heal it" (that's been said - it's true) and when we embody ourselves, our true and honest experience of living, even if we don't know what the hell happened to create that hard place in the belly or that familiar recoil in the nerves or that weird sounding voice that we know is not our true voice (ok, these are a few of my things), if we can just fall back into our true experience of all of it in the moment in the body, as a good friend who will not leave in hard times, the bodymind's urge toward wholeness, unity with self, unity with all - our essence beyond all conditioned traumatic holdings - does engage, and healing happens. It does. We don't have to remain traumatized and separate. As meditation and self-inquiry becomes more widely practiced and as mindfulness-based therapies such as Biodynamic Craniosacral, Somatic Experiencing, Hakomi, etc. reach more of us, amazing resolutions begin to happen in our lives and in our collective awareness. I included the graphic "Physiology of an Uninterrupted Third Stage" because it shows something so simple that can make a huge difference in human lives - not rushing things right there at birth. We are actually capable of feeling the residue in our bodies from any trauma we experienced at birth, and by feeling it in a safe way we might find some understanding of how that very early trauma has shaped our lives. When it is felt in a safe and aware environment, such as a bodymind therapy session or well-resourced meditation, the twists and turns in the tissues actually begin to heal. As a society of humans who are healing, reunifying and rising, our collective awareness leads us to change the way medical interventions are routinely done that cause trauma to our systems. Just as what's considered normal societal practices change and become more humane over time as we understand the actual life effects of all sorts of behaviors, such as human enslavement, sexual harm, ritualized killings for ceremony, etc. When trauma at any level is resolved through our own bodies, harmonious connections are remade that go beyond our own lives. We participate in telling the ultimate story of unity and we enjoy living here and now and helping each other thrive.​ Namaste. I've been thinking about authority. What is real authority, really? I think when it's authentic it just shows up, the way water runs downhill. Authority shifts positions within a group of people depending on the topic at hand because different people know more or less about different things because we've all had different experiences. Of course that fluidity takes humility, paying attention and a willingness to change roles within the group. If we're identified unquestioningly with certain roles then we get stuck with a preset authority figure who's supposed to know all the things. Longterm I think this kind of structure leads to distrust because it's unstable and becomes defensive - a whole lot of small, fortified kingdoms ruled by fools, so to speak. Traditionally in our culture, authority has been assumed to belong to men. Man as head of household, man as boss of company, man as hero and God. Another traditional view is that adults always have authority over children and are supposed to tell children all about life. All of this is changing as we learn more and it's a sloppy, unsophisticated dance we're doing to clarify who in the group really does knows more, from actual lived experience, about the topic at hand. For me, the dance step that is most sloppy right now is - When to interrupt? And how? Noticing when either I or another person has fallen asleep behind the authority wheel and is driving into a bog. I can't rightfully complain if I'm sitting in the car letting it happen and I definitely can't complain if we end up in a bog that I drove us to. Ok, if I'm getting clear that complaining is not helping then what else should be done? How can I interrupt this momentum so that we can go somewhere better than a bog? Oh, another thing that doesn't work all that well anymore is just leaving. I get into the habit of looking for my exit when I feel trapped in a bad authority situation, but over time I notice that if I leave this one I'll just show up in another one. What do I really want? I want to dance with authority! I want to dance with the people I'm with in this moment and the next. There are many ways to dance but my favorite way involves some agreed upon structure and then a lot of freedom and improvisation within it. The model of authority is changing, and it creates a more trusting world as we each step into and out of authority with more and more ease. I was confiding in my journal this morning about a situation (or a few) that happened on Christmas and came to looking at a value that lives in me about authority, leadership, sharing of power among people. I did pretty well with standing in my own shoes, and there were plenty of times when I caved in too. It’s been turning over in my head for the past few days and I’m imagining those icky moments, having done them differently. What would that have looked and felt like? It always comes back to the most obvious purpose for people gathering - connection, belonging, friendship. I can imagine going ahead and assuming my own authority in a way that breaks the spell and invites a new level of connection and honest relationship to grow among us. I can also recognize those moments when I actually did that through my own dense conditioning and it wasn’t absolutely perfectly amazing but it was good. You see, my historical habit around authority has been to follow whoever's habit it is to lead. I've tested it for years and that model does not typically create a thriving situation! So, time for something happier. Last night a woman at Lockhart prison mentioned that during her sentence she took a class called "women's health". I asked her what that class was like and she essentially told me they learned about disease - how to avoid getting STDs, how to check for breast cancer, and other problems... She mentioned nothing about health... I felt the sinking feeling again that comes in regards to how our culture regards our bodies and the messages that are ingrained in our beliefs about fear and distrust of our nature. I'm sad that people in prison are bombarded with a religious view that is just another prison of the mind and I'm sad that women who have already endured a lifetime of hurt are being taught more bad news about their bodies. One common example is that many people (woman or man, in prison or not) were molested as children, which hurts a young psyche, severs our sense of self and invades our rightful dominion of our bodies. Add to that an ongoing "education" about bodies as basically uninhabitable places that have to be vigilantly measured and monitored for intruders, that are basically sinful and need to be saved by an imaginary man god so we can be whisked off to heaven after the misery of this life has passed. Such a conundrum. This is all sad because it's a terribly flawed belief system that interferes with our inherent capacity to thrive freely in our bodies, in our lives and in our world. We cannot teach what we don't explore and plenty of people are out there teaching about "health" but what they're really doing is teaching about fearing our bodies and managing the consequences of that fear, because in a very direct way the attitude creates and maintains tension that makes the disease scenario come true. Plenty of people are also out there preaching about salvation but what they're really doing is passing on this story that says humans are bad and have to be saved. No. Humans are manifest forms of life. We are conscious, incredibly elegant bodies that are designed by the movement of life, quite literally. Embryology is a brilliant science that carries a growing understanding of how lifeforce animates the cells, tissues and structure to develop *in response to movement*. We are movement! Biodynamics is a brilliant science that carries a growing understanding of how life flows in form, how life creates the shape of all this we see. We are fully capable of inhabiting our bodies with clear and real discovery so that we can experience more and more and more of this freedom that is already our nature. The play of the relationship between consciousness and form is where it's at - dynamic and robust in every one of us. In our uniqueness and our universality. We are not sinful and we are not disease. We CAN condition our minds to fear ourselves and the world so that we live in a continual state of tension and stagnation, preventing the flow from doing it's awesome renewal thing *if we choose*! Or we can choose to stop believing these dismal stories and go with the flow that is us. Traumatic experiences that have conditioned our minds and bodies to contract in the face of life CAN heal. This is our nature. Any class called "women's health" or "men's health" or just "health" needs to be oriented to the flow of life, not the blocking of it. Otherwise call it "illness and vigilance class". Or how about "sad class"? Haha! In our culture we're so used to the sad story that we don't even notice how sad it is. Sure, all kinds of wild, crazy, graceful, funny, boring, painful, beautiful, scary, darling and ridiculous things happen throughout a lifetime, and we are fully equipped to go through the contractions and expansions, to learn and heal and grow as we go. Nature is resilient and life is incredible. I want us all to embody it for real. My 2018 resolution is to teach health and to not back down about it. In 1992 I was doing my open water diving certification. It was February, the water a chilly 49 F with a couple of feet visibility and my borrowed wetsuit was too big so water flowed continually down my back. We descended one at a time with our instructor to the required depth, holding onto a line so we wouldn’t get lost in the murk, and we performed our skills which included removing our masks and regulators. I removed my mask and immediately inhaled all the water I could take into my lungs. That was not one of the skills to perform! In a reactive panic I flailed and started to launch upward to the surface, which would have done me some harm due to the sudden pressure change. It was then that my instructor revealed herself as an underwater Zen master. What I remember most is her gloved hands and bright clear eyes reaching me through her face mask. She held onto me and silently taught me how to regain myself in the moment, to feel my body and trust my breathing and equipment. She taught me that I could return from panic. I had to. In early 2014 I was standing on the sidewalk several minutes after T-boning my truck into the side of a car that pulled out in front of me, trying not to unload my near bursting bladder. After reporting the crash, checking if the young woman who drove the car across my lane was ok and she then talking on her phone I began to feel the jarring impact anchoring into my jaw, neck and spine. It felt like the harshness of the concrete sidewalk and the destroyed metal of my truck’s front end was becoming part of my body. As I imagined the mess of having to ride in an ambulance and all the stuff that would come after - massive expense for the kind of help that isn’t really needed for injuries like this - I remembered that I’m a yoga teacher, a bodyworker, a meditation practitioner, and that I’d lived through many situations by trusting my body and reclaiming the flow of healing from my worried thoughts. I began doing what I knew to do and what I teach to others. I consciously turned back toward myself exactly where I was. Yes, my bladder was beyond full, yes the sun was baking my skin and I hadn’t showered yet that late morning so I was funky ripe, and yes I didn’t “know” what the outcome of anything would be and it seemed like a really long time by then and no cop or tow truck had come. I began to breath confidently into my body and connect with my feet on the ground, my legs and hips, my whole body equally. I gradually, gently and faithfully moved my jaw, head, neck, shoulders, etc. through subtle range of motion, not pushing against but getting inside the tension, being with myself as the underwater Zen master had been with me. By the time I did leave the sidewalk I went home with no serious pain, just a little normal soreness. My nerves were calm, the impact and worry that followed had run clean through. I had helped and felt my body reclaim the flow of health right there on site of the injury, and I went home and happily peed. In 2017 I was jogging in my neighborhood and didn’t see the 2 inch hard seed ball that had dropped from a tree. I know that when you throw one of those balls hard against the street they burst into thousands of seeds and threads but I discovered that when you step on one and you weigh around 115 lbs that they stay solidly formed. My ankle folded dramatically to the side and I reflexively folded over and held it repeating “oh no, oh no” for probably a minute. One car drove by eventually. I stood there shaky and unable to put any weight on that foot or bend the ankle to even sit down so I was stuck standing on the road as if in quicksand, wondering what would happen now. My plans were rolling through my mind as I wondered if I’d be unable to do them, let alone get myself home, and then I remembered. I very subtly began to move what little I could in the foot and ankle, first just testing to see if I could move it, and then to help reopen the traumatized tissues back into flow. My whole body and awareness was right there with the ankle, my breathing was satisfying and confident, I felt like a good friend to myself, encouraging, not pushing, honest communication between my brain and body to stay with what was actually true. After a few minutes I walked S L O W L Y and mindfully home. By the time I got there my ankle actually felt amazing. Not like it was all healed up but like it was rich in the healing flow. I could feel the warm potency of my body’s fluids and healing constituencies flooding the tissues and it felt powerful. Once I was able to prop myself on the couch with an ice bag, I was chill. I have no doubt the total healing time was much shorter than if I had withdrawn from my ankle and followed my worries down the sad road of immobility. I think "Zen master" is a great description for that state of focused kindness that will not leave us until we are capable of breathing again on your own. I love how normal it is for us humans to come to the aide of a person who is caught and struggling and on the verge of despair, and how normal it is that we can do this for ourselves every day. I am an advocate for us all to find our way back to our bodies, to reclaim our natural embodied healthcare and faith in ourselves and each other.